It’s been 10 years since the last meaningful peace deal was put forward by Israel to the Palestinians. That peace deal included the creation of a special committee consisting of representatives from five nations to manage the religious sites in Jerusalem. It went on to offer a transfer of territory to the Palestinians equivalent to 5.8 percent of Israel in exchange for the main settlement blocs making up around 6 percent of the West Bank. The deal included Palestinian ease of passage from Hebron to the Gaza Strip. However, the Palestinian leadership never responded to this comprehensive offer and subsequently the negotiations ended. Fast forward to the present, and the conflict seems mired in mutual recrimination. Palestinians insist that Israeli activity in the settlements is undermining peace, while Israel continues to point to the unrelenting incitement and terror attacks against Israeli targets as proof that the Palestinian leadership offers no partner for peace. So what can we learn from the past as a guide to the future? The man who put together that deal was Ehud Olmert, Israel’s then Prime Minister. Taking office after the incapacitation of Ariel Sharon, Olmert oversaw the country’s initial years following the Disengagement from the Gaza Strip, and undertook the most audacious and comprehensive offer of a settlement to the Palestinian leadership. Accordingly, the Henry Jackson Society, together with Dame Louise Ellman MP are delighted to invite you to a meeting in the House of Commons with Ehud Olmert, Former Prime Minister of Israel. 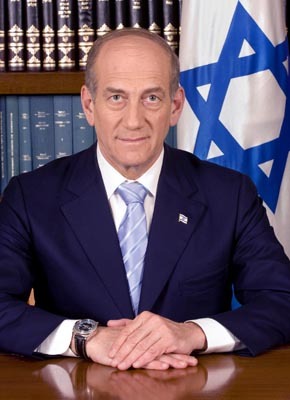 Ehud Olmert was elected to the Knesset in 1973, becoming the youngest member of Israel’s Parliament. After serving in the Knesset for 20 years, Olmert stood for election and became the Mayor of Jerusalem in 1993. In 2003, the then Prime Minister, Ariel Sharon appointed Ehud Olmert to the office of Deputy Prime Minister. In 2006, Sharon suffered from a stroke and Ehud Olmert became the Prime Minister of Israel, holding the office until 2009. On Tuesday the 19th June, The Henry Jackson Society was very privileged to host Ehud Olmert, former Prime Minister of Israel (2006-2009). We were treated to a wide-ranging talk in which Mr Olmert offered his thoughts on current international issues regarding Israel and the Palestinians as well as the wider Middle East, and offered some more personal reflections on his time in office and the nature of leadership and negotiation. The former PM began by talking about the situation on the Israel-Gaza border. Olmert reminded us that after pulling out in 2001, Israel today did not occupy any territory in Gaza, a decision he regards as fundamentally the right one, but despite this Hamas led attacks had been targeting Israel from Gaza since day one. Part of the reason for today’s continued patterns of violence and conflict thus must lie with the lack of goodwill showed by Hamas after the Israeli withdrawal. The fence was the border, Olmert continued, and no Israeli government, or indeed any Western government in a similar situation, would allow potentially threatening terrorists to break through. However, he also emphasised the point that the question of whether Israel was doing enough to address the humanitarian situation was a legitimate one, and stressed the vital importance that the means Israel used to defend itself would result in the absolute minimum amount of casualties, even if some were inevitable. He acknowledged mistakes may have been made in this very tense exchange in very uncomfortable circumstances, and these should be owned up to. It was important to remember too though, that Hamas remained a terrorist organisation, uninterested in the development of Gaza, but only in the development of its military infrastructure. He pointed to the debate in Israel and the insistence among much of the population that while Gazans had chosen Hamas as their rulers in an election, Israel should attempt to help the people of Gaza meet their daily needs. Olmert strongly agreed with this, arguing that Israel can do more without accepting responsibility for the overall situation. Olmert then moved on to other issues, explaining that Iran’s attempts to consolidate itself in Syria represented a serious and explicit threat to Israel. As such, Israeli action against these threats in the last few months had been appropriate and justified. Israel, he asserted, had a duty to act sooner rather than later, as any conflict which would occur further down the line would likely be more protracted and bloody. Russia and its involvement in Syria and the region was a more nuanced situation. Putin was not the same as the communist regime that came before, and was no enemy of Israel – he even allegedly described Israel as a partly Russian country to Olmert, due to its high proportion of Russian speakers. Nevertheless, Russia would not pull-out of positions of influence gained in the region, and Russian flexibility and willingness to work with Iran was something that Israel needed to watch closely, cautioned Olmert. In a related vein, Russia’s selling of missile defences to Syria and other nations may be significant in that a more capable defence could prompt increased aggression, as actors believed they were better able to absorb retaliation. Again, Israel would need to remain vigilant. Returning to Iran, Olmert relayed that he believed the situation with the JCPA was an improvement over the situation without it, even if the deal itself was not perfect. Trump’s decision to pull-out of the deal without offering consultations or any alternative may have resulted in a situation worse than any other. Having said that, it was not for Israel to halt Iranian nuclear development through strikes or other such means. This was, he argued, a superpower responsibility, and a situation in which Israel should not act alone. The best scenario would be for the other nations party to the deal to continue respecting it – otherwise Iran would be left with too much room to manoeuvre. Discussions then moved on to the prospects for an Israeli-Palestinian peace, a topic he was still very clearly passionate about. Olmert lamented that there currently was no peace process, and no exchange of ideas between the sides. The most significant movement could be if the Trump Administration were to propose some kind of deal, as Olmert believed Trump would not propose something if he did not believe it could be achieved. We were then given at outline of the deal that Olmert himself proposed to the Palestinians when he was Israel’s Prime Minister. This included a plan based on the “1967 borders” with minor land-swaps meaning Palestinian townships around Jerusalem would be part of a Palestinian state, the Holy Basin would be administered in a trust by five nations (Israel, Jordan, USA, Saudi Arabia, and the Palestinians), and an agreement to discuss refugees in the context of the Arab Peace Initiative. Olmert stressed he still believed there could be no peace as long as there was exclusive sovereignty of the Holy Basin held by any one nation, and Israel needed to decide whether it wanted to exercise its historical rights or to find an alternative arrangement that would satisfy its desires while also allowing for peace. Similarly, Olmert made very clear that Israel could never accept an unfettered right of return on behalf of the Palestinians, and this is something the Palestinian leadership needed to come to terms with. This deal was obviously never concluded, and Olmert noted that Abbas who he had met 36 times in office had never even responded to the deal, which he had shown him in depth. In Olmert’s view, this lack of response was due to a resistance to the recognition of Israel, and a lack of leadership particularly from the Palestinians. Yet, Olmert remained open to future developments, as he recounted that back in 2008, while Abbas never said yes, he also never said no.